Tyrann Mathieu is expected back at practice Thursday. 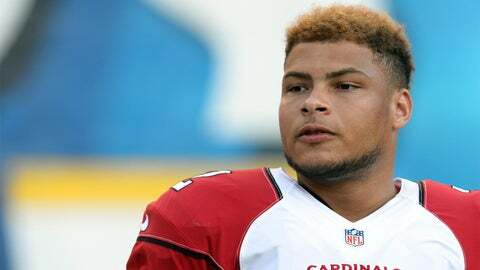 Starting safety Tyrann Mathieu and wide receiver John Brown were among three players who missed practice Wednesday for the Arizona Cardinals. Linebackers Alex Okafor (calf) and LaMarr Woodley (chest) also sat out, but Cardinals coach Bruce Arians said he expected both Mathieu (bruised heel) and Brown (hamstring) to be back at practice on Thursday. Markus Golden will draw the start at outside linebacker in place of Okafor, who was hurt in Sunday’s rout of the Detroit Lions and is expected to be sidelined for 2-to-4 weeks. Cornerback Cariel Brooks was moved from the practice squad to the active roster to take the place of cornerback Chris Clemons (hamstring), who was placed on season-ending injured reserve Tuesday. Brooks said he had ample experience playing on special teams in college. Limited in Wednesday’s practice were cornerback Justin Bethel (foot), tight end Darren Fells (hip), safety Tony Jefferson (neck) and safety Rashad Johnson (hip).